Some mysterious pictures of what seems to be an upcoming NVIDIA Titan based on the Volta GPU have appeared on Facebook (via Videocardz). 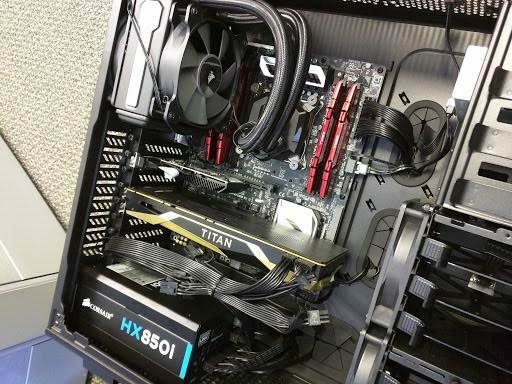 The images were posted on Facebook by an intern at NVIDIA and we are genuinely excited by what looks like NVIDIA next-generation enthusiast graphics card. We cannot confirm at the moment if the upcoming graphics card is based on Volta or Pascal GPU but it looks like the former might be used. We will get into more detail on that bit later but first, let us talk more about the card itself. So first up, we clearly see the “Titan” branding on this card which confirms this is a new ultra high-end graphics card aimed at enthusiast gamers and professional content creators. That’s where the Titan branded cards are aimed at nowadays, they are attended to be used for both, gaming and creation purposes. It’s similar to AMD’s Radeon Pro Duo series and comes at higher prices when compared to gamer aimed variants. 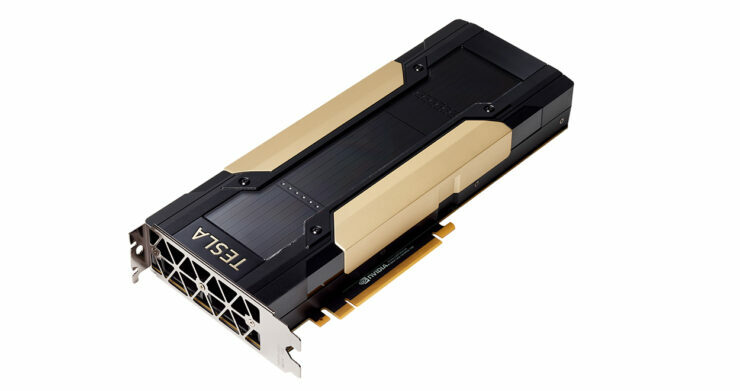 The NVIDIA Titan Volta cards uses a black and gold color scheme which is surprisingly similar to the Volta GV100 based cards that NVIDIA showcased at GTC 2017. Now the card posted over at the ocn forums shows a similar design language on a current generation NVTTM shroud which we know and love since the GeForce 10 series cards arrived on the market. While most of these things can be made similar through modding, there are some things which cannot be customized on a card. These include the SLI interface on the PCB which has been removed from the card. Instead, the card uses the NVLINK 2.0 interface which delivers faster interconnect speed. We cannot tell if this is NVLINK 1.0 or NVLINK 2.0 but in the case of the latter which is being used on Volta, we are looking at 300 GB/s data transfer speed between two or multiple GPUs. This is a significant update over SLI and will yield better performance scaling over SLI and SLI-HB configurations. The second thing is the most obvious, the Quadro GP100 and Tesla P100 PCI-Express variants have power connectors on the back. This card has power connectors on the side which is similar to a lot of gaming cards. The card comes with an 8+6 pin power configuration. The other thing is that the card currently lacks any display functionality which is why there’s a PCIe 3.0 x4 discrete graphics card in the top most PCI-e slot (EVGA GeForce GT 1030) being used for display output. 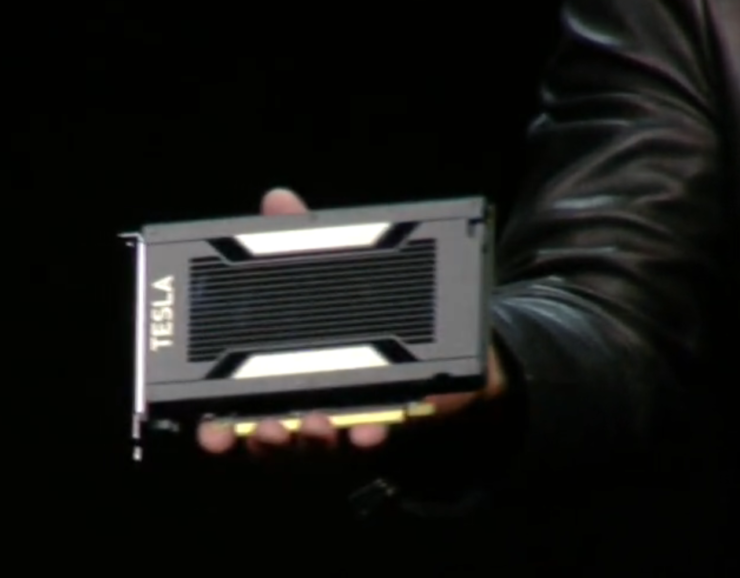 So while the card is not yet ready for consumer launch, it’s definitely in one of the machines at NVIDIA HQ and the possibility of seeing this card launching in the months ahead is really high. Another question also arises and that is whether this card is using GDDR5X or HBM2? It’s quite simple in fact to answer that. 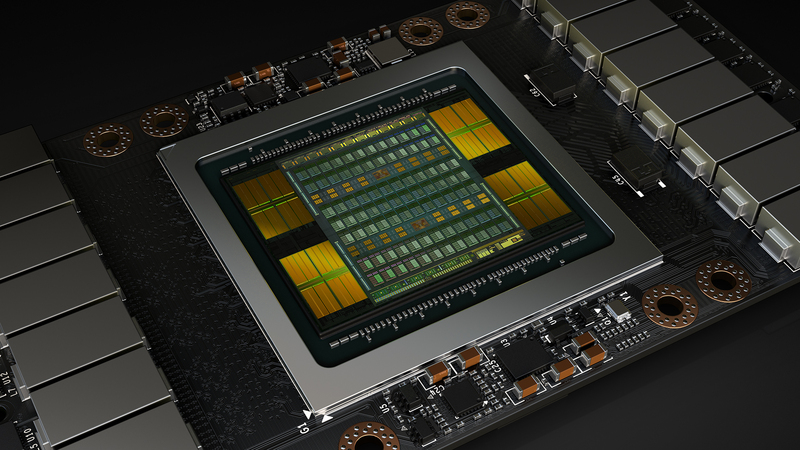 The two GPUs that NVIDIA has shown to utilize their NVLINK inter connect interfaces are fitted with 16 GB of HBM2 VRAM. It’s not known whether NVIDIA will streamline the use of NVLINK across their cards when Volta hits the market but for now, HBM2 and NVLINK is used on GP100 and GV100 GPUs. Both cards feature HBM2 and NVLINK on their PCIe and mezzanine board based products and I am under the impression this card does the same. 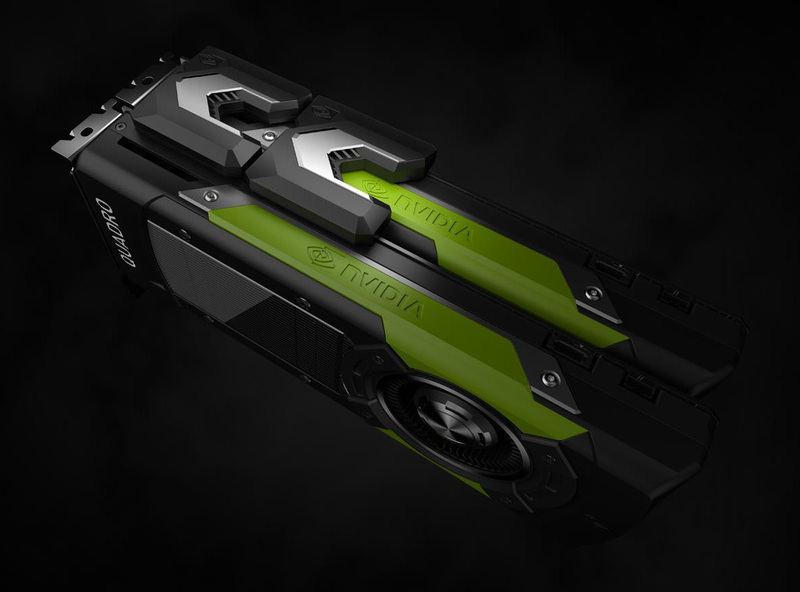 Plus, NVIDIA have already released the Titan Xp which uses the full GP102 GPU configuration and is theoretically faster than a GP100 GPU with similar specs due to higher clock speeds. So the only advantage the Titan Volta will have is HBM2 and NVLINK which are not such significant changes to warrant a new Titan card. So there you have it, that’s all we have as far as this card is concerned but for more details on NVIDIA Volta GPU architecture, you can head over to our deep-dive article over here.